Indonesia SWG dispatched a mission to Indonesia, following the pre-mission in July 2011, in cooperation with Japan Embassy and JICA. Based on research so far, they investigated the intended sites and had in-depth discussions with provincial agencies of PLN(Perusahaan Listrik Negara; State Electricity Company), local authorities and organizations. And also they visited MEMR(Ministry of Energy and Mineral Resources) and provincial bureau of Energy and Mineral Resources, governor and built up a human network. Member: Ms. Okada assistant director of METI, , Mr. Kaneda, Fuji Electric Co., Ltd., as the leader of Geothermal Power Generation WG, Nippon Koei Co.,Ltd., Nippon Steel Engineering Corporation, Mitsubishi Heavy Industry, JGC and so on.. Organized by MOIT(Ministry of Industry and Trade), JICA and JASE-W, workshops & B2B meetings for business matching were held in Hanoi and Ho Chi Minh, Vietnam. Also Mission members visited MOIT to introduce their products & technologies and discuss on potentialities of EE business in Vietnam. Mongolia SWG dispatched their representative a pre-Mission to Ulaanbaatar and Sainshanda, for the purpose of the research of possibilities of solar power projects. Visited: Gov.Dundgovi, Meteorological Bureau, Ministry of Mines & Energy, Agency of Energy, Energy affiliated organizations, and site tours for the industrial complex planned sites, the power line & heat supply plants and so on. Latin America SWG dispatched a Mission to Brazil, following the pre-mission in October. Japanese governmental head was Mr. Miura, Director for International Affairs of Energy Conservation and Renewable Energy Dept. ANRE and private head was Mr.Tanaka, President of Mayekawa MFG Co.,Ltd. 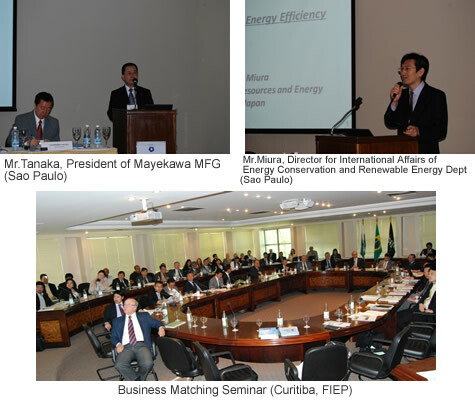 At Forums of Sao Paulo, Rio de Janeiro, Critiba, Mayekawa MFG Co.,Ltd., Hitachi Zosen Corporation, Sekisui Chemical Co., Ltd., Panasonic Corporation made presentations. They visited Petrobras, Estre Ambiental, Gafisa Eldorado Business Tower, Empires de Pesquisa Energetica, CTS Ambiental, Copel and so on. In cooperation with JETRO, Latin America SWG dispatched a pre-Mission to Brasilia, Rio de Janeiro and San Paulo for the research beforehand of "Brazil Energy & Environment Business Matching Meeting in the end of October 2011 hosted by JETRO". Members;MAYEKAWA MFG.CO.,LTD., Mitsubishi UFJ lease & Finance Co,Ltd. HITACHI ZOSEN CORPORATION Visited;19 sites including MDIC(Ministry of Development, Industry and Foreign Trade), MME(Ministry of Mines & Energy), Brazil Steel Institute, FIESP(Federation of Industry, state of Sao Paulo), Petrobras, Eletrobras and so on. Indonesia SWG dispatched a mission to Indonesia for discussing the geothermal development issues and exchanging latest information on the development plans and the support systems, in cooperation with the Ministry of Economy, Trade and Industry and the Embassy of Japan in Indonesia. Visited : Bureau of Energy Efficiency (BEE) as a regulation agency together with Indian companies like Essar Oil Limited, Bharat Petroleum Corporation Ltd, Rashtriya Chemicals & Fertilizers Limited, which have so far been interested in Japanese EE technology. 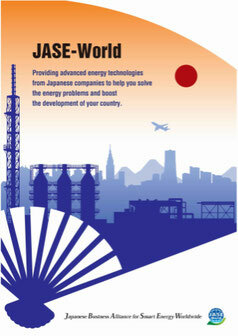 Mission tries to collect practical energy data as well as to discuss on issues of the energy solution. Indonesia SWG dispatched a public- private mission to Indonesia, in corporation with METI and Japan Embassy in Indonesia, for the purpose of promoting a waste to energy projects using municipal waste. The mission member visited key personnel of Ministry of Public Works in Jakarta and Sanitary Department in local cities. 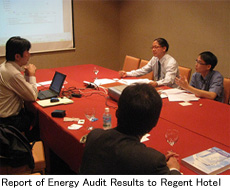 JASE-W presented a report on the results of partial energy audit at Regent Hotel (Four Seasons Hotel) which Yamatake Corporation (Azbil) practiced in the end of last year on behalf of JASE-W. The mission visited EMA (Energy Market Authority) together with NEA (National Environment Agency) to express sincere appreciation, because this audit project was introduced by them.